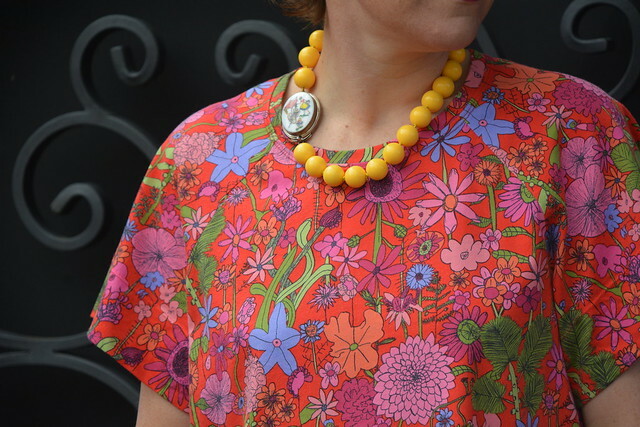 My very loose ‘to sew’ list is grouped into two categories – Spring/Summer and Autumn/Winter. 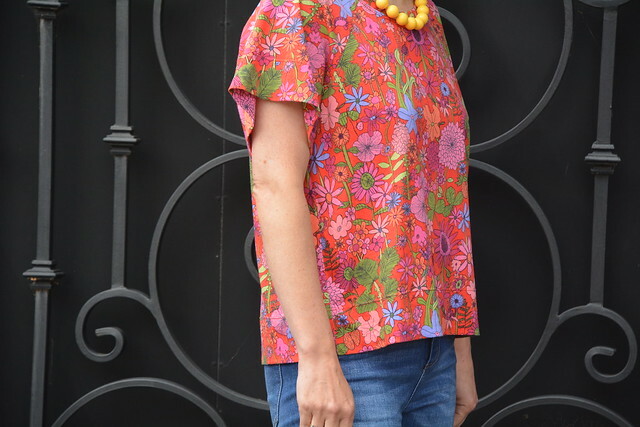 This Aeolian Tee in glorious Liberty cotton jersey was my last make of Spring/Summer 2016/17. It was the perfect t-shirt for our family trip to Sydney in early April. This pattern never lets me down! Glorious fabric, colour superb, you always look very stylish….!! Ria in the Eastern suburbs. Thanks Ria. I’m really pleased with this tee. The fabric just makes my heart sing. I must confess that I stopped counting after 10… surely I must be nearing the 20 mark by now! Beautiful! Perfect top for a summer send-off. 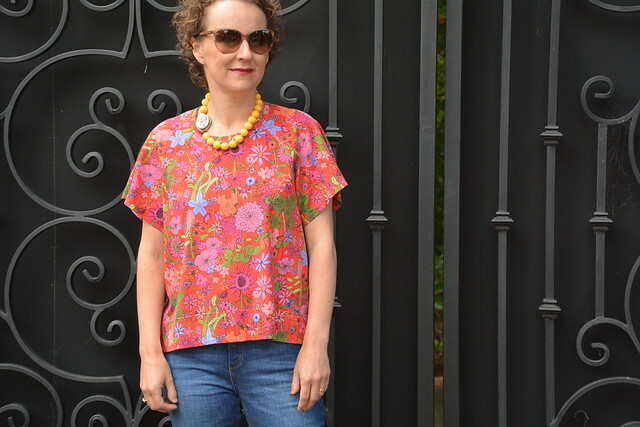 I’m a little sad to say goodbye to summer Sarah Jo, but I’ll be pleased to pull this tee out again as soon as Spring and warmer weather arrives in Sept/Oct. I couldn’t agree more Jenya, but I’m a little sad that warm weather sewing has been put aside. That being sad, I’m embracing the long sleeve top and boiled wool coat sewing at the moment. I love the print, it’s so colorful! Perfect for getting you in the mood for summer! Thanks Melanie. I’m dreaming of summer as I it’ll be winter here (in Melbourne) soon. Beautiful! I love that print. Such wonderful colors. It’s a great print Lynn. Will it find it’s way into your stash? 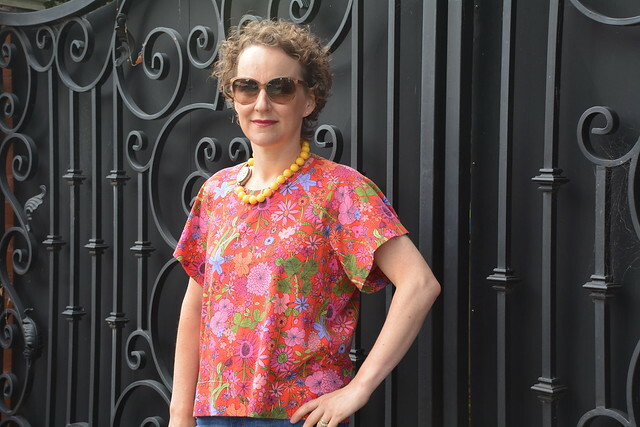 I love your Aeolian tees and this one in particular and the more recent crumpled linen. When you make this pattern in woven fabric do you size up? And do find the sizing in general is pretty accurate. Hi Joan. I didn’t size up for any of my woven Aeolian Tees. I measured the bust of the flat pattern to decide what size to make. I like to have 3-4″ of ease in the bust for a boxy pattern like this. I hope this helps. Best of luck.